Spike strips stop vehicles by deflating their tires. Over the last couple of decades, law enforcement and border control officers have used these devices to disable the vehicles of drivers attempting to evade apprehension. Spike strips are a much safer option than previously used methods such as ramming the vehicle or boxing it in. In order to be effective, spike strips must be positioned just right. The goal is to cause the tires to deflate quickly, but not too quickly. Carefully controlled deflation is crucial to the success of the strip. Most spike strips come in three-foot sections. This often leaves a gap in the road, allowing motorcycles to avoid them. This is extremely problematic when trying to stop vehicles from crossing the border without permission. It’s crucial that spike strips do not create an opportunity for individuals to evade them. Mint Controls’ spike strips are made from high-quality stainless steel. This prevents rust and ensures their durability and longevity. Our strips include a positioning sensor to ensure accurate positioning of the strip. This eliminates the chance of error. Our spike strips have plastic tips. They will not break off or cause damage to anything under three hundred pounds. This makes our strips safe for use around dogs and most humans. 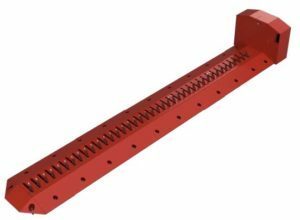 Our spike strips are mounted above the ground to allow for easy cleaning and reduced obstruction. They come in convenient, two-foot sections. This allows for greater coverage of roads, reducing the chance of evasion. Our strips leave only a one-foot gap. This is far too small of an area for small vehicles or motorcycles to escape apprehension. Mint Controls’ spike strips are more efficient and provide better coverage than any other spike strip available today. Our Raptor Spike Strips provide an effective and reliable solution for stopping and disabling vehicles.